Thirty of the most iconic cinematic masterpieces starring the most famous monsters of horror movie history come together on Blu-ray for the first time over in the “Universal Classic Monsters: 30 Film Collection. What can one say about these movies that haven’t been said thousands of times? The Universal Monsters are horror icons that have transcended the silver screens into the minds of just about every human being alive. Characters like Dracula, Frankenstein and his bride, the Mummy, the Invisible Man and the Gill Man have become pop culture icons and have ingrained themselves in everything from art and movies to social studies and psychology studies. You can’t have a Halloween without gazing upon the eyes and fangs of Dracula or the tattered clothes and tufts of fur of the Wolf Man. This collection of 30 of the most iconic creations of man spans a twenty five year period in which these monsters reigned supreme. Not only do you get entire runs of characters’ early films but you also get a monstrous slew of character specific bonus features included on their individual discs. There are behind-the-scenes documentaries, classic interviews with the likes of Bela Lugosi, Boris Karloff and Lon Chaney Jr. to name a few as well as expert commentaries, archival footage, theatrical trailers, a 48-page collectible booklet and much more. 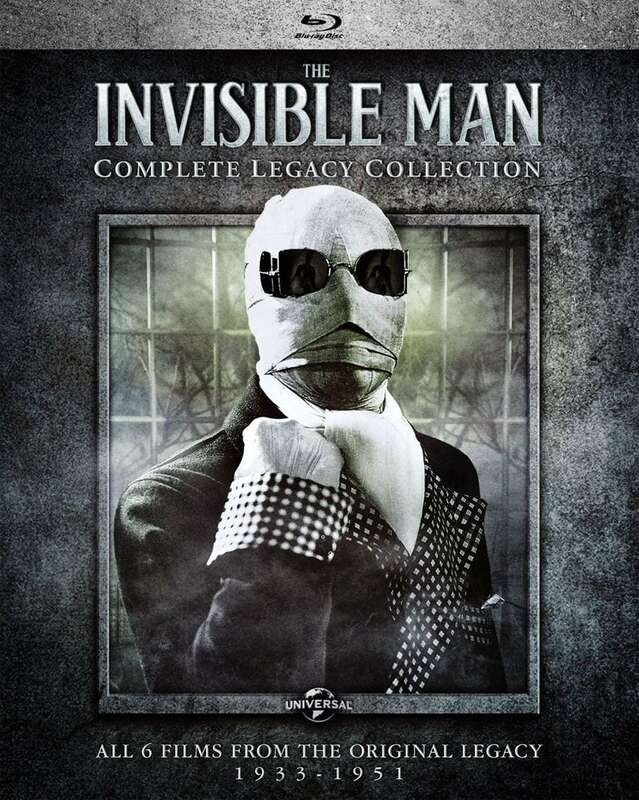 Included in the set also are the classic horror comedy pairings of Abbott and Costello as they encounter the Mummy, the Invisible Man and Frankenstein. No Universal Monster collection could be complete without those film staples! Most of the movies have been released in HD on Blu-ray in the past but there are a large number of the various sequels and spin-offs which are making their first appearance in high definition in this set. While these movies are predominantly black and white, the remastered versions look as stunning as ever. There was a lot of care put into bringing these movies into a modern format and viewers won’t be disappointed as they follow Dracula stalking the night or the Phantom of the Opera rocking out on his church organ in all of his ghastly glory. The packaging is simple with a nice outer sleeve that nicely fits all 7 monster collections as well as the collectible booklet. It has an embossed rusty patina style for the logo and set description and the layout on the back of the box set provides you with plenty of set information as well as a listing of every movie in order of their initial release date. For those that love watching things in chronological order, this is a handy checklist to have. Each individual monster’s collection comes in a separate Blu-ray case with thematic artwork and also provides information such as the chronological order of the movies in the subset as well as the bonus features included. This makes sense because each of these sets are also sold separately for those that might have a particular interest in some monsters over the others or that may not want to fork out $100+ for the complete set. Bonus features such as the interviews and documentaries are absolutely amazing as you get an insider’s view into the making of the movies and the history and cultural impacts of the Universal Monsters. The collectible book is a work of art unto itself as it feels like a pocked-sized version of “Famous Monsters” or “Fangoria” to flip through. Inside it you’ll find actor bios, trivia, movie posters and movie synopsis for a handful of the classic films. This is a nice little addition to round out this collection. Whether you have a fondness for these monsters of universal renown, whether you have a love and passion for movies that inspired an entire genre, whether you’re a collector of everything related to the classic Universal monsters or even if you’re watching these movies for the first time…this set will provide you with endless hours of entertainment and information. This wasn’t something that was just slapped together to throw on the shelves leading up to the Halloween season. I couldn’t be happier with every single thing that is included in this set. 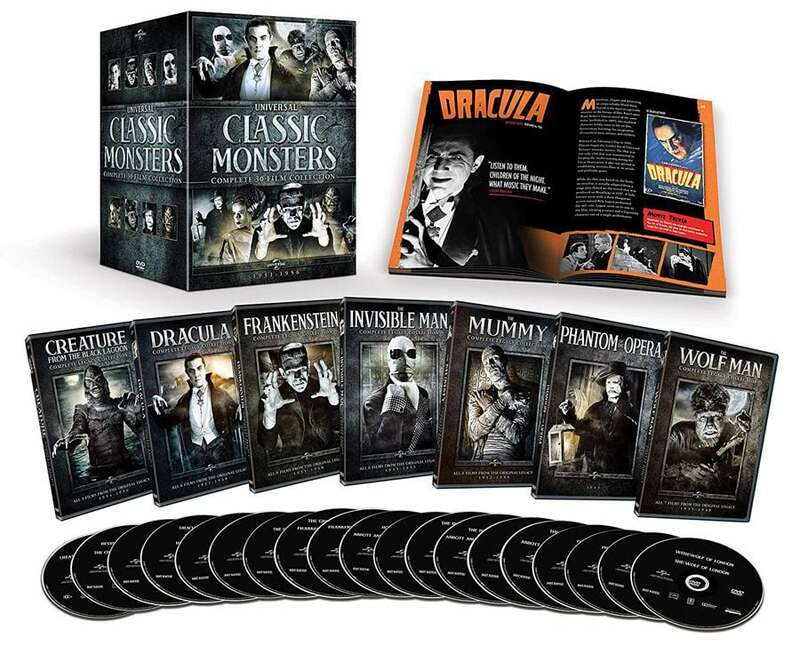 The “Universal Classic Monsters: Complete 30-Film Collection” is everything ghoulish and macabre that you could hope for as you travel back to the golden age of horror films to relive the beginnings of these film icons. Just don’t forget to pack your silver bullets! Bottom Line: This collection is one of the most well-conceived and implemented box sets out there. All of your favorite Universal Monsters show up as well as the must-see Abbott and Costello mashups. It is absolutely everything any fan of Dracula, Frankenstein or the Wolf Man among others would want in a complete collection. Release of the decade!!! Of the century!! !